On January 1 of this year (2019) we had a very unusual visitor show up at the Whalon Lake Forest Preserve near my house west of Chicago. I understand from a fellow birder that the woman who discovered it was too afraid to report it because no one would believe it, so another birder reported it. 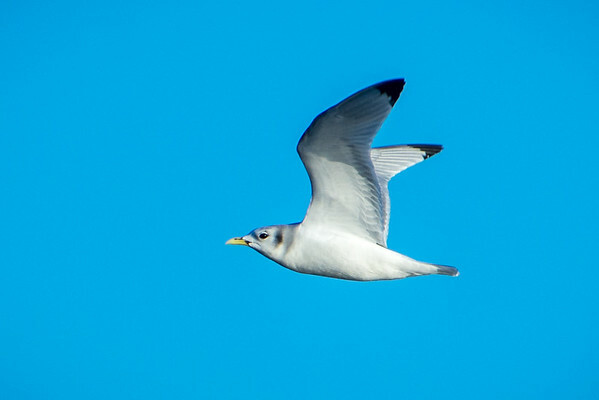 But she was right, and we were pleased to host a Black-legged Kittiwake for a few days! Chiefly oceanic. Spends most of year at sea, with wide range of conditions, from edge of pack ice to moderately warm waters off Baja. Favors areas of upwellings, and sometimes concentrates over edge of continental shelf, but may occur from coast to hundreds of miles out. 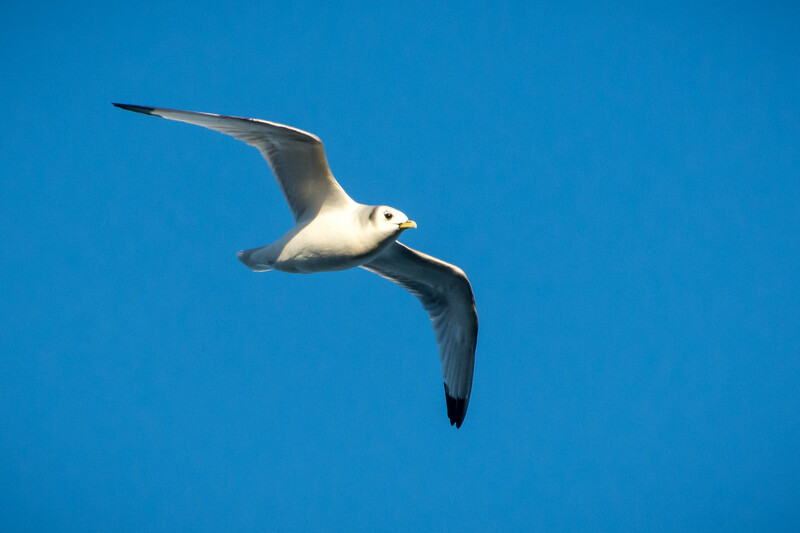 It’s actually a pretty bird, for a gull. 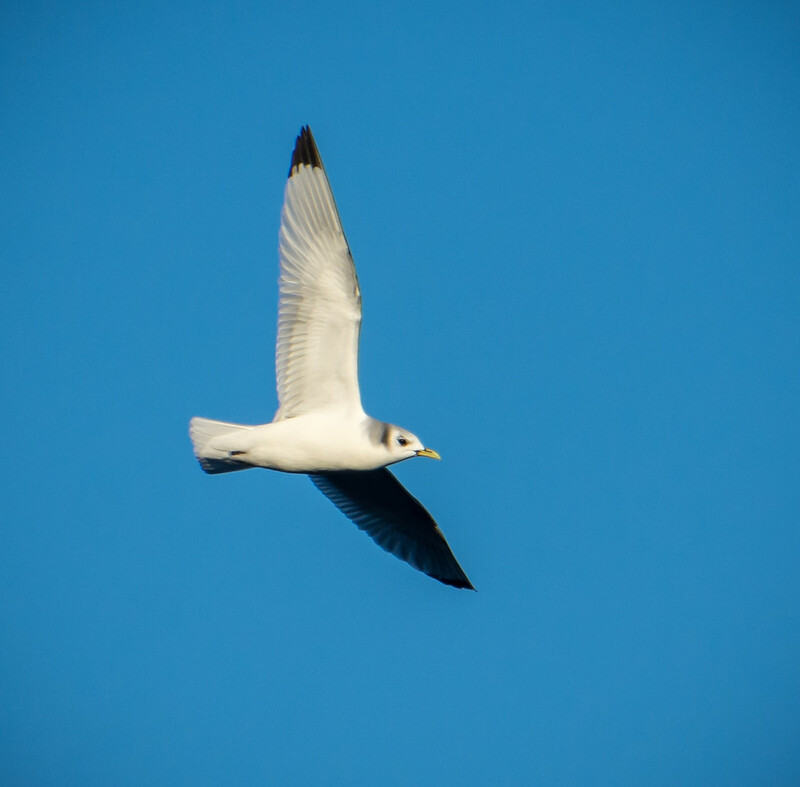 These pics were taken near sunset, which darkened the bird’s feathers a bit in the flying shots. 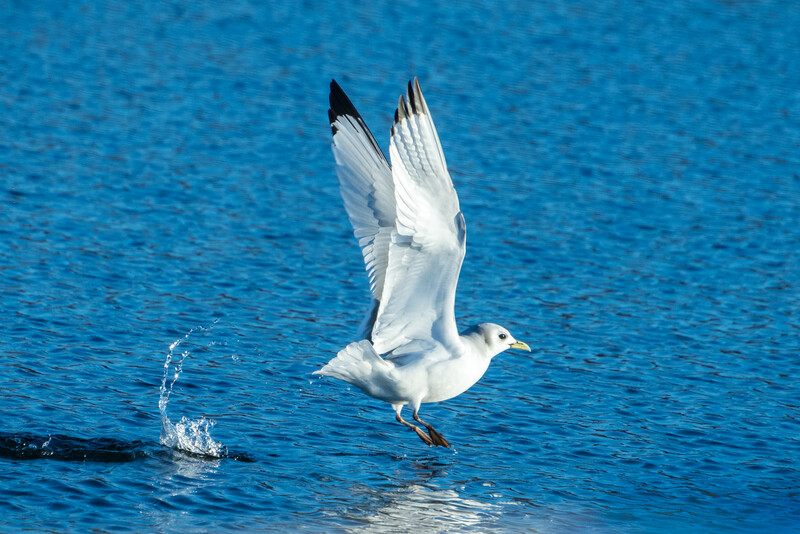 The later shots on the water show the true whiteness of the feathers. The defining characteristics of the Black-legged Kittiwake are nasal “ki-ti-waak” callnotes (which I did not hear), a small yellow bill, a white head and underparts, a black smudge at the ears for non-breeding adults, a gray back, wingtips “dipped in black ink” without white spots like other gulls, and of course, short black legs that can be just barely seen in the photo above. I also found out from other assembled birders, and discovered this to be true, that they beat their wings faster than, say, Herring Gulls. They can dip or dive in flight to catch fish, preferably, or they can catch fish while swimming. I was standing next to another birder with his scope when the Kittiwake flew toward us, so I stepped backward with my camera to catch it after it cleared the birder, when suddenly it dropped in the water right in front of us! However, because I had stepped backward the wooden railing of the dock blocked the lower half of the bird!! I was off-balance (I know this is a thrilling story) but I leaned forward taking pictures anyway. The photo below has a brown cast along the bottom because that was the out-of-focus wooden railing, and it was all I could do in post-processing to minimize the effects with tone enhancement and vignetting. I managed to move another step forward before the Kittiwake took off and managed to get a shot of the definitive black legs. It looks pretty happy after eating the fish. This encounter was a nice antidote to missing a rare Red-Throated Loon several weeks earlier at the exact same location by just minutes because I grabbed a hamburger at McDonald’s on the way. I’m sure my brother feels sorry for me about that. Here’s a bird I’m very familiar with! They nest just a few miles along the coast. The juvs are nice in flight with tri-coloured wings very similar to the rare Sabines Gull. 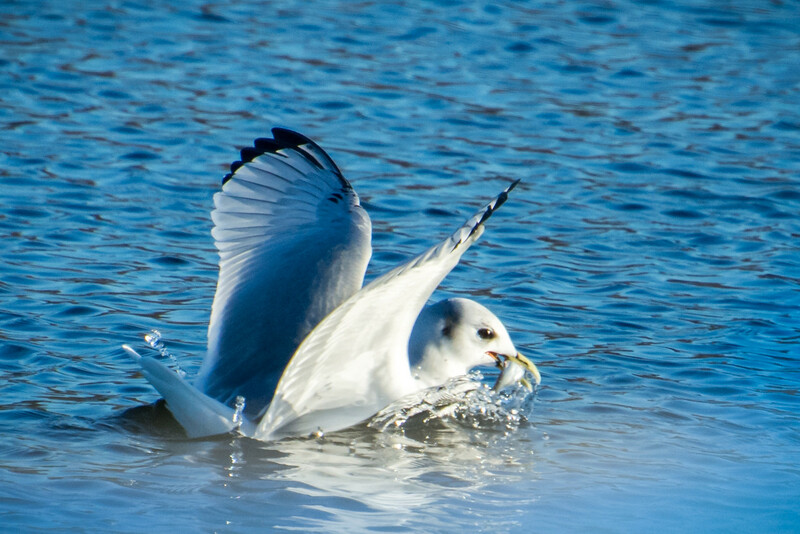 Sadly the Kittiwake is now on the list of highly threatened birds facing extinction. Strange to turn up so far inland but that’s nature for you always throwing curve balls. As for B missing out (we call it dipping) the number of times I’ve driven hundreds of miles through the night and done the same! It makes me cry thinking about it. I remembered you mentioning that you have these in the UK, Brian. I didn’t know the Kittiwakes are so endangered! That’s really a shame to hear. I like the term “dipping”! I’ll definitely be using that one. There was a juvenile Piping Plover at Montrose Beach along the Chicago shoreline since October, refusing to go away for the winter. The Illinois Department of Natural Resources spent three separated days trying to catch it with mist nets to put it in the Lincoln Park Zoo for the winter, and the bird outsmarted them every single time. It’s endangered as well, and I’ve never seen one but everyone around here has seen it there. So after all this time I finally drove there a week ago to get photos of this most cutest bird and it had left that morning. The day before I went the entire Chicago Audubon Society had posted pictures of it. Talk about dipping big-time. But I think I’m about 50% overall on chasing these rare birds, which I can’t complain about. Thanks for your comment! I didn’t realize the juveniles had a black bar along their wings and down their flanks until you prompted me to look it up. I used to have a pager run by a service called Rare Bird Alert, this would give up to the minute information on location etc. Can you imagine how it feels when you are driving somewhere fast (too fast!!) and the news comes through the bird has flown! This is why we call it ‘twitching’ you develop a nervous twitch! I gave the pager up this year, couldn’t afford it anymore, after twenty years. Feels strange not knowing whats about, I still get an e.mail every month with the highlights but that’s as much use as a chocolate fireguard! I got to this page by going to the main eBird link I gave above and clicking on the Explore tab and entering “Norfolk”, whence it popped up possibilities for Norfolk including England. Clicking on the date next to a sighting takes you to a unique checklist for that person for that day, and the sighting location and a link to a map is provided for that checklist. You can also click on the other tabs along the top such as Hotspots and such. The Species Maps link on the Explore page pulls up interactive maps to zoom and optionally select sightings by species and date range in zoomed areas. You can sign up for a totally free eBird account, and when you have one you can go to the “My eBird” page or click on “Alerts” on the Explore page and sign up for rare bird alerts by email (and maybe in the eBird app, I don’t know) by country, county, etc., including the county Norfolk in the UK. You can specify hourly or daily emails or both by whatever area you choose. Hourly reports by eBird are my main way of getting rare bird alerts in my county, along with a Yahoo group for Illinois birders that I set to email out posts as they occur. There are a couple Facebook groups for Illinois that I subscribe to, but these are for pictures mostly so they are a day or more behind. Many birders keep their life lists on eBird, which is all free because they do incredible research on migration and species counts based on these crowd-sourced inputs–you can see their research on their site. eBird has its own smartphone app to check off birds on a walk and then sync to your account, and other birding apps sync to it as well, or the information and any photos can be entered from a browser. This is how eBird automatically sends out rare bird alerts. Their data is public (and huge–I think the whole thing was about 38GB compressed and about 125GB after it was uncompressed–I downloaded it a few months ago and did some data analysis of it for fun). Cheers Ron I shall check this out. I’m a bit of a dinosaur and don’t possess a smart phone so receiving notifications would only be through e.mail on the pc, which I don’t check often but I will give it a look. What a shame B missed out. Are you sure you didn’t wait a short bit to call him? Can’t believe that this gull is to far inland. But, we read an article here about birds and migration are getting confused because of global warming and the changes in the magnetic fields around the earth. Maybe this could be one of those possibilities? Great blog post. Thanks! Brian and I work as a team on these birds, so I’m sure I called him either right at the dock when I was taking pictures or maybe back in the warm car. I asked Brian if he could come the next day (Friday), but he had to be at work, and Saturday was out because of a dog show as I recall, so it was Sunday before he could drive over. I monitored the Kittiwake reports throughout, and they were rolling in through late Sunday morning before he arrived. Then a report came in that it was seen about 15 miles South of that location at a large pond before it took off for good. The Ross’s Goose that Brian came over for was mingling with domestic geese for a year and a half, literally, and I went and saw it a few times and even drove there to verify it was still there two weeks before Brian drove over. I’ve had much better luck driving over to see birds near Brian, including a White-Faced Ibis last summer, though it took two trips to see the Western Kingbird the previous year. Thanks for your comment. I don’t know why the Kittiwake was so far off course. I did read that the North magnetic pole is moving faster than predicted at the moment. I think it is great that you and Brian are passionate about birds and willing to share with those of us who just want to understand more about them when we are enjoying the outdoors. I bet with the current cold weather there that bird has flown to warmer an area. What is this I see, another post!?! Ah yes, the devious Kittywake although I have come to call it Prettyfake in recognition of that damn bird deciding to skedaddle out of there within an hour so so of Linda and I getting up there. Not that I am keeping count our anything, but I am 0-2 on heading up there to get a rarity – the other being the Ross’s Goose (which I would content should really be Ross’). However, do not feel bad for me, when we missed the Ross’s I almost immediately found a Hooded Merganser which I’d been hunting for a long time (ended up seeing one about every place we stopped to look I believe). Even with the Kittwake, we decided to drown our sorrows at the local casino where Linda managed to win over a $1000. Besides, it’s the hunt that makes this hobby exciting. If they were to say mail us one from the UK it wouldn’t be as sporting (pssst, I’m still open to that option, but don’t tell Ron). I think these shots are fantastic and the 4th one down makes me green. Stop worrying about the brown highlight, it just looks like a stray sun ray through the clouds or better story yet the shadow of an Eagle looking for some easy food. Not to mention .. well, I am technically mentioning it, someone asked you for these shots for a local publication. Enjoy your +1 over me – losing ground again. Oh, also thanks for telling me where the ocean is hahaha. Something tells me that Ross’s Goose is on the queue. Yes, 0 for 2 coming over here, but we’ve been successful chasing birds elsewhere. (You could have added coming over to see the Wilson’s Snipes at Midewin as a miss as well, but I won’t bring it up. Or the Henslow’s Sparrow.) It’s been great when I’ve driven to see birds over by where you live–Black-Crowned Night-Herons, White-Faced Ibis’s, Soras, Louisiana Waterthrush (oh, you missed that one), Snow Geese, Black-Necked Stilts, Scissor-Tailed Flycatchers, Eurasian Tree Sparrows, Western Kingbird (on second try), Lark Sparrow, Yellow-Billed Cuckoo, etc. We have had good luck at Montrose Point in Chicago, and we did see a Black-Billed Cuckoo near here at Midewin, plus the birds we’ve gotten at Chain-O’-Lakes State Park and Goose Prairie Natural Area and Gander Mountain (the first trip, NOT the second). Just no luck nearer to me. Mailing a bird from the UK is not prohibited in our current rules, but is frowned upon. 🙂 The Ross’s Goose was considered for the next post, but I don’t want two white birds in a row.